Kia ora to everyone back on shore. Here is an update from our good ship received via text and it is a special day for Rosa as it’s her birthday! The trainees and crew had an early start, with a wake up call at 0630 and no early swim! The Poor Knights were calling so they hoisted up the anchor and had a sunrise off to the Poor Knights. Jordon was on the helm while hot chocolates were handed to everyone. Tony then took over the helm, then Kaya followed by Jess, who did a great job. Once at the Poor Knights, the trainees and crew had breakfast followed by the usual chores that have to be done on a daily basis. Then everyone apart from Toby went for a snorkel to enjoy the crystal clear waters of the beautiful islands. Following the snorkel, lunch was served on board before they upped anchor for Whangaru Harbour. Main, foresail and the headsails were hoisted and a course was set. Abby and Jordan took turns at steering, while lessons were delivered on route. Eventually the ship and trainees arrived at Puriri Bay and they had a birthday cake to celebrate Rosa’s birthday. Happy birthday Rosa! 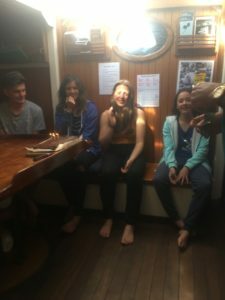 Then everyone went ashore to play games and enjoy 30 minutes of silence to reflect on the experiences of the day. Once everyone was back on board, there were more lessons on navigation before a delicious dinner. Everyone is now doing the dishes before the evening highs and lows of the day. Great to see our lovely granddaughter Roza being part of this fantastic experience.